Boys who have appeared in the entrance exam of class VI and IX are waiting for the publication of AISSEE merit list 2019 and eligible students for next round of medical and interview. Merit list will be published on 4th February 2019. The final merit list is scheduled to be published on 11 March 2019. Latest: AISSEE final merit list 2019 released for few regions. In this article, we have shared a detailed note on the admission procedure and entrance exam of Sainik Schools. From application form to exam syllabus, readers are going to get all the information here. Released, Click on link to check now. Quick Update 04/02/2019: As per schedule, result/merit list 2019 for sainik admission will be released today. We are monitoring the official site and will update this article with all the important notification. You can keep visiting us to get all latest information. Or you can press bell icon to get instant notification on your smartphone when result will be released online. Quick Update 24/01/2019: Sainik School society is done with the checking of the exam sheet and now uploading result online along with merit list. AISSEE Sainik School Wait list 2019: Released along with final merit list. So, scroll down and go through the article. Applicants/Readers will definitely find it beneficial. Sainik Schools are one of the renowned public residential schools of India. Sainik Schools around the country run through the Sainik School Society under the authority of Ministry of Defence, Govt. of India. These schools were conceived in the year 1961 with an aim to provide quality education to the boys of economically weaker sections of the country and to prepare them NDA and National Naval Academy. Presently, there are a total of 28 Sainik Schools in India. All these schools are affiliated to the Central Board of Secondary Education (CBSE). Only boys are eligible for admissions to these schools. Sainik School Society conduct an entrance test for the candidates (who are only boys) to provide admission to them in class VI and class IX. Here is the list all the Sainik Schools established in the different locations of India. It is important for all the applicants/ guardians to read the eligibility criteria before filling the application form. Any candidate found ineligible at any stage shall be disqualified. Only boys are eligible for admissions to Sainik Schools. For Class VI – Candidates must be between the age of 10 to 12 year as on 31st July 2019. For Class IX- Candidates must be between the age of 13 to 15 year as on 31st July 2019. They must be studying in class VIII in a recognized school. Candidates must also have qualified the entrance exam. For admission to Sainik Schools, interested candidates have to fill an online application. Candidates must be ready with all the documents and testimonials before filling the application form. Candidates have to visit www.sainikschooladmission.in first. Now they have to click on the online registration link and have to enter the required details such as mobile no, email ID, personal details, qualification, and other details. Once the details are submitted an application no. and password will be generated that will be intimated to the candidates through the registered mobile no and email. Now candidates have to log in the application page with the application no. and password. They have to upload a scanned copy of their recent colored passport sized photograph and signature in the format prescribed by the conducting authority. Once the form is filled, candidates have to make payment of the application fee. It can be paid through Credit card, Debit card or Net banking. After the payment of application fee, candidates can edit or make a correction in the application fee within 72 hours. After payment, students have to upload all the documents. In this step, candidates can check the admit card by entering the application no. and password. The actual date of the exam, examination venue and time will be mentioned in the admit card. After the confirmation of application, form candidates have to make final submission of it. They also have to download and take a printout of the application form for future correspondence. Note- Candidates those who have registered are required to make online payment of application fee within the 48 hours of registration otherwise registered form will be discarded and candidates have to make a fresh registration. Check here detailed user manual for application procedure. 67% of Seats out of the remaining seats are reserved for the boys of the state in which School is situated and 33% seats are open for students of other states and union territories. Scanned passport sized photograph and signature in the prescribed format. Birth certificate for proof of date- Candidates can upload the migration certificate issued by the previous school or exact date mentioned on the service document or birth certificate issued by the competent authority such as Municipal Committee/ Corporation/Board. Domicile Certificate issued by the state govt. Caste Certificate issued by the state govt. Antonyms, Synonyms, Homophones, Gender, Vocabulary usage, Sentence types, One-word substitute, Comprehension, Essay Writing, Verb Forms, Adjective, Nouns, Adverbs, Grammatical Structures, re-arranging words to make sentences etc. The medium of the exam is English, Hindi, and other recognized official languages. Application forms are filled only through the online mode. Candidates must read the instructions mentioned in the brochure before filling the application form. In case of any discrepancy in the application form, the candidature of the applicant will be canceled. Exam centers are not finalized until the admit cards are live at the official website. Admissions are strictly based on the order of merit in classes 5th and 8th. 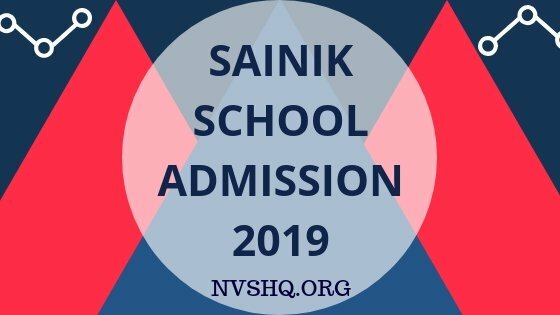 Stay in touch with this page and official website for the latest updates regarding Sainik School admissions. You are cheating my roll no. is 604159( other state general category) for class 6. I get 225 marks. I am qualified for class 6.nvshq.org team You said’s my roll no. is waiting list but, my roll no. is 604159 not waiting list. Session 2019-20.
please tell me. I am waiting for you reply answer.